To be a journalist or a member of the media in 2014 — or anyone who cares about the future of either or both of those things — is to be caught between two conflicting emotions: One is enthusiasm about the seemingly endless supply of information and the web’s democratization of distribution, and the other is despair about how traditional media business models are failing to keep up. The latest World Press Trends report on news consumption manages to find support for both of these views. On the bright side, the report from the World Association of Newspapers or WAN-IFRA — which is based on surveys in more than 70 countries — shows that news consumption both in print and online has increased by almost 25 percent in the past year. According to the association, a total of 2.5 billion people consumed the news from printed newspapers in 2013, while 800 million did so online (it’s not clear how the report accounted for potential double-counting). There’s no question that a larger audience for news is a good thing, but as the continued financial woes of mainstream newspaper publishers have shown, monetizing that audience is becoming increasingly difficult. 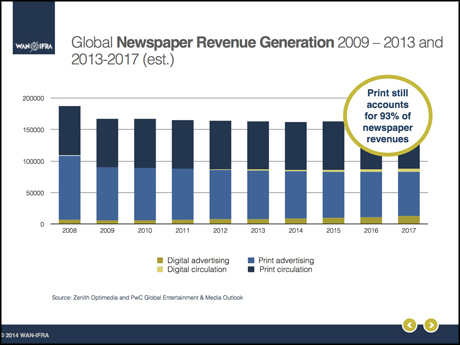 Print-based advertisingcontinues to decline at a rapid pace as advertisers move online and look for different ways of reaching consumers, and not only are digital revenues failing to fill that gap, but it’s unclear whether they will ever manage to do so. 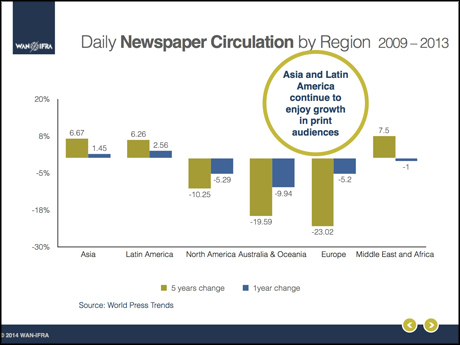 According to the latest World Press Trends ranking, while print circulation continues to hold strong — and in some cases even increase, in places like Latin America and Asia — when the report’s results are aggregated from around the world they show that print circulation has fallen two percent over the past five years, and print-advertising revenue has fallen by 13 percent. While 46 per cent of the digital population visits newspaper websites, newspapers are a small part of total internet consumption, representing only six per cent of total visits, less than one per cent of total pages viewed and only around one per cent of total time spent. So what should newspaper companies do? Kilman says publishers need to figure out how to connect and engage with their readers in as many different ways as possible, in order to build their brand loyalty and get to know their audience better. Coincidentally enough, this is exactly the kind of advice contained in the recent internal “innovation report” from the New York Times.